We may be experiencing an early onset of June gloom here in the Bay Area but that certainly isn’t stopping me from dusting off the grill in preparation for the long weekend. It’s the start of summer, after all! So after you devour Karen’s Korean gochujang sliders and achieve that perfect buzz from Todd’s smokey olallieberry cocktail, might I suggest throwing some grilled pineapple for dessert? How topping it with creamy vanilla ice cream? And why not smother with a burnt caramel sauce, spiked with rum? 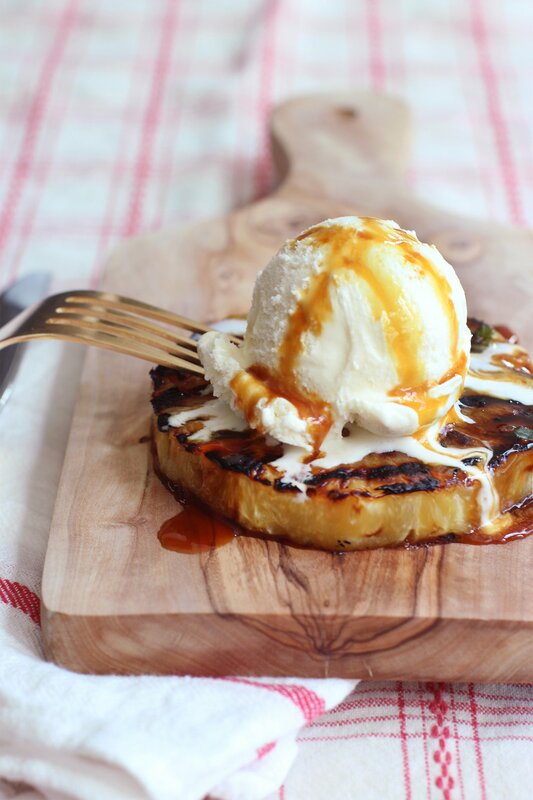 My version of grilled pineapple à la mode is a guaranteed crowd pleaser – and quite possibly the most fuss free dessert. Love this!!! Do you cut the core out of the pineapple?? This is so brilliant! Love the pics too! OH MY GOODNESS…that looks so delicious! So easy to make. Um, those sliders with that cocktail and this for dessert? I think you guys are pretty much winning on Memorial Day!